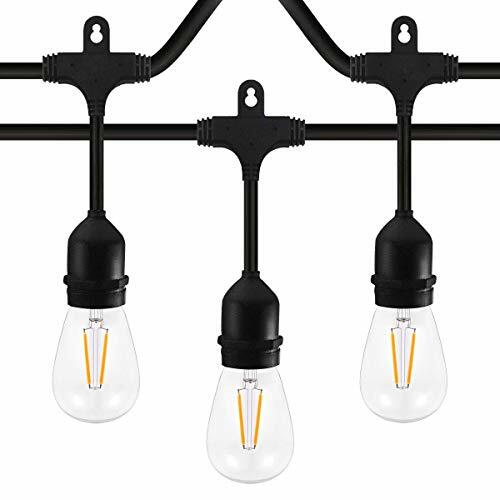 2W Power Consumption for each LED bulb,each strand of Classyke String Lights support 960W Power Consumption, so you can link 32 sets to achieve the perfect length for any installation. ❄️ Easy To Install: These string lights are easy to install with a convenient loop on each socket for easy installation with eye hooks or zip ties. ❄️ Wide Use Occasions: This LED string lights is perfect for indoor outdoor use, patio, bistro, deck, pergolas, gazebos, home accents, camping, market, Christmas, parties, wedding or bedroom, bringing you a fantastic moment. ❄️ Two-year Warranty: We offer two-year warranty longer than those who only offer six months or one year warranty, customer satisfaction is our top priority, please don't hesitate to contact us if there is anything wrong.